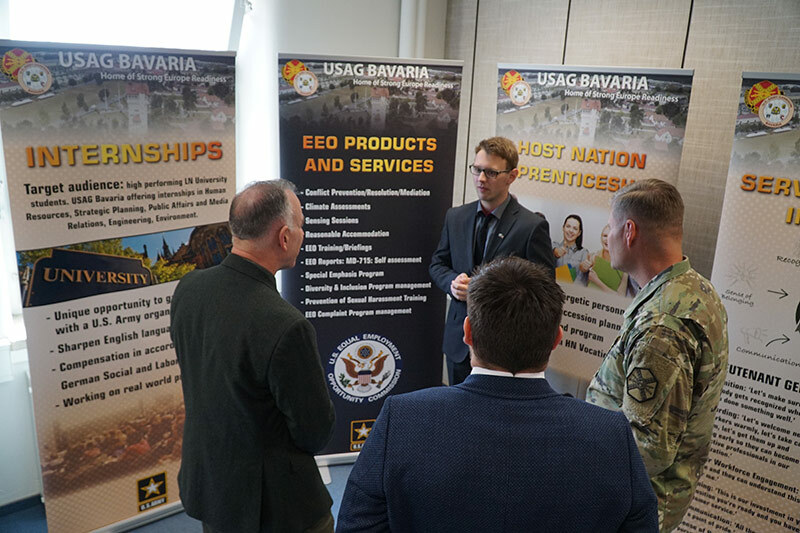 GRAFENWOEHR, Germany ─ U.S. Army Garrison Bavaria leadership and employees gathered here at Tower Barracks April 12 for the opening of the first Service Culture Center in Europe. “Today’s opening marks the culmination of something that we’ve been thinking about for well over a year,” said Col. Lance C. Varney, USAG Bavaria commander. The center is a product of USAG Bavaria leadership, the garrison’s Directorate of Human Resources and Installation Management Command’s guiding customer service mission. Through the center, the garrison continues to augment IMCOM’s Service Culture Initiative, which focuses on six components: onboarding, recognition, training, leader workforce engagement, communication and sense of belonging. Lt. Gen. Kenneth R. Dahl, IMCOM commander, describes the initiative as a way to enhance the level of customer service and instill a culture of service excellence within all aspects of the command. It “is designed to ensure our employees are prepared for and empowered to deliver services in the best possible manner,” and create excellence in customer service. “There are workforce development offices in Ansbach and Wiesbaden, but there wasn’t a service culture center to provide all these opportunities to the workforce in one place in Germany or in Europe,” said Dominik Farnbauer, workforce development assistant. He added that USAG Bavaria leadership has referred to the program as the spark plug for other garrisons in Europe to emulate. The center offers programs for current U.S. and local national employees to include customer service training, newcomer briefings, leader and professional development plans, career planning, civilian education system assistance, annual mandatory training, and apprenticeship and internship program partnerships for German schools and universities. The Army offers a wide variety of training and development opportunities. This center provides resources and opportunities in one place for career progression, said Tina Shingle, workforce development assistant. “The benefit is that people can train themselves and develop themselves to reach their goals or their interests. That’s our purpose,” Farnbauer said. The center expects to provide services to approximately 1,600 personnel working at USAG Bavaria. Farnbauer added that while the main center is located on Tower Barracks, employees at Garmisch and Hohenfels will have access to a space with information resources and contact information. The center’s employees are also working on potential monthly or semimonthly visits to those installations. Employees are invited to visit the center and take advantage of the resources, as well as schedule appointments with the workforce development team. The center is located in Bldg. 621 on Tower Barracks and is open Monday through Friday, 8-11:30 a.m. and 1-4 p.m.